The Lancaster Hoard is one of North West England’s most spectacular Bronze Age discoveries. 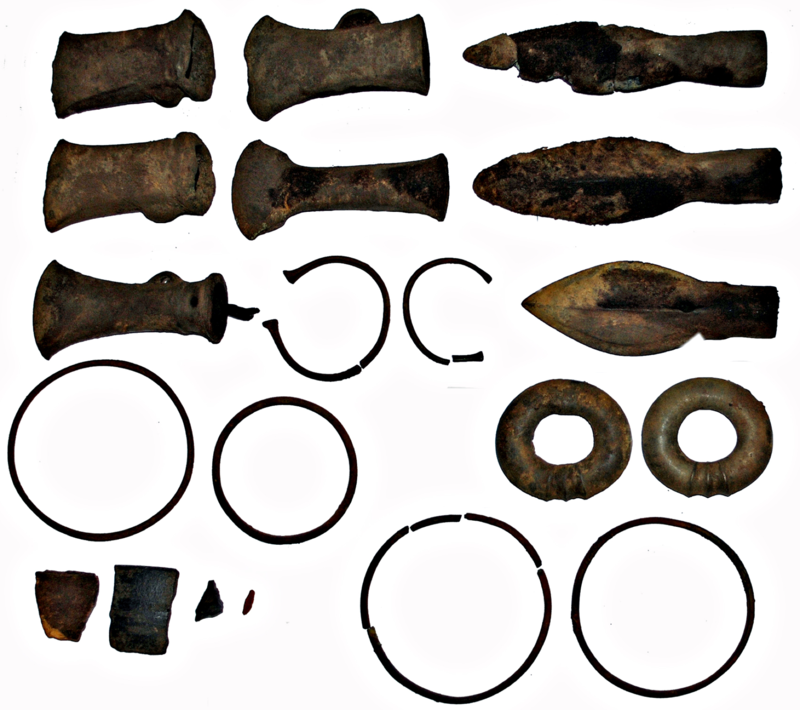 The hoard is a collection 16 bronze artefacts, including five socketed axes, three spearheads, two bracelets, four armrings, and two horse harness rings. The particular style of the axeheads and spearheads suggests that they are about 3,000 years old, and were made during the Late Bronze Age between 1,000-800BC. You can explore the hoard and its contents in more detail below. This dried flower was found tucked inside one of the axeheads when it was taken for examination in the lab. 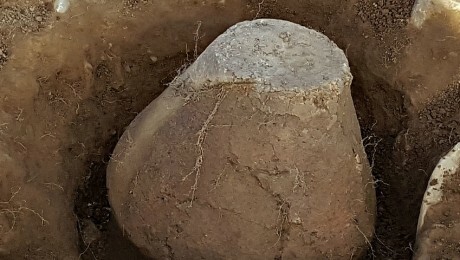 Archaeologists also found a sliver of wood and some hazelnut shells. At first thought to have been a thistle, more recent analysis suggests it might be meadowsweet – a flower with a strong smell and flavour that has been found on Bronze Age sites all over the country. It can be used to scent spaces and spice fermented drinks. It can also be used medicinally since it contains the components of aspirin. 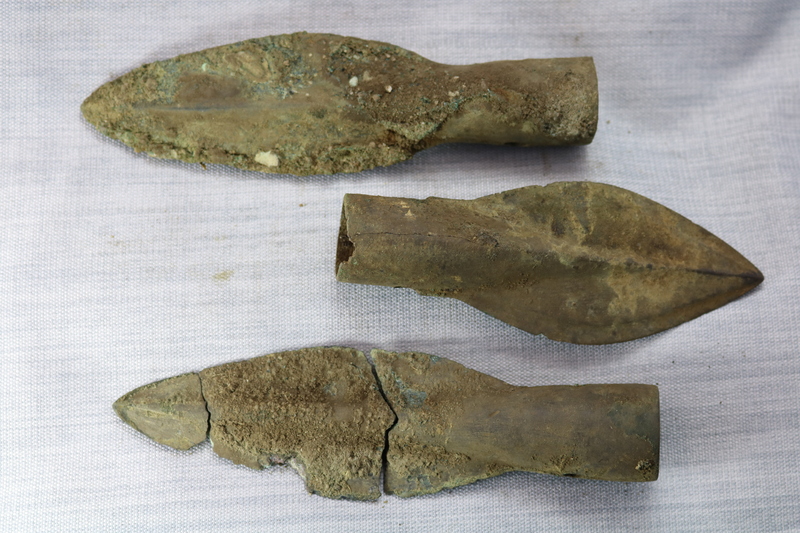 Throughout the Bronze Age, axeheads are developed and re-developed and these socketed axeheads represent one of the final evolutions of the form. Axes were often used for working wood, and would have been hafted onto a wooden handle using the D-shaped loop on the side. Archaeologists found a small piece of wire inside one of the sockets, which might have been used to help fasten it onto a handle. Along the sides, you can see the seams where the two halves of the mould used in casting met. Each has a collar moulded below the mouth of the socket, which shows some Irish influence in the design. 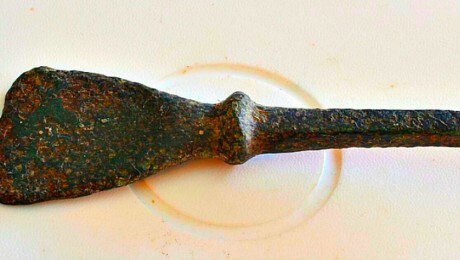 This bronze axehead is one of five, but it is unique among the collection. Unlike the others, it does not have the small D-shaped loop on the side near the open socket end to aid with fastening of the metal to the wood. Its crescent-shaped blade and narrower body also make this piece to stand out among the other axes, and has been dated to 1,000BC-800BC. There is some debate over what this hollow bronze ring would actually have been used for, as similar rings found elsewhere in Bronze Age hoards have been theorised as various parts of bronze cauldrons and hanging pots. The two possible harness rings in the hoard are roughly the size of a camera lens-cap, and weigh only as much as a tennis ball. Spearheads, probably late Bronze Age 1,150BC-800BC. These leaf-shaped bronze socketed spearheads date fromEach has peg holes on the socketed edge to enable them to be attached to a wooden shaft. A sliver of this wood was actually discovered inside the socket of one of the spearheads. They may have been hafted to short staves to create throwing weapons, while longer spears would have been used for thrusting or lunging attacks. 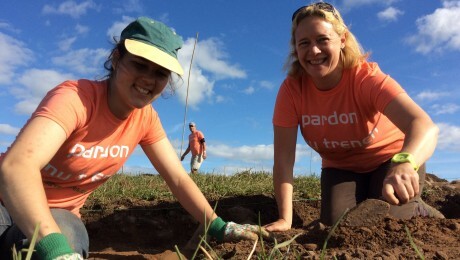 Each spearhead in the hoard is a little bit less than the length of three golf tees end-to-end. Bracelets like the two above are often considered status symbols, but they may have also been used as currency. In the Bronze Age, people also made and wore intricate gold bracelets, as well as torcs which are open rings worn on the neck that can look like larger versions these bracelets. 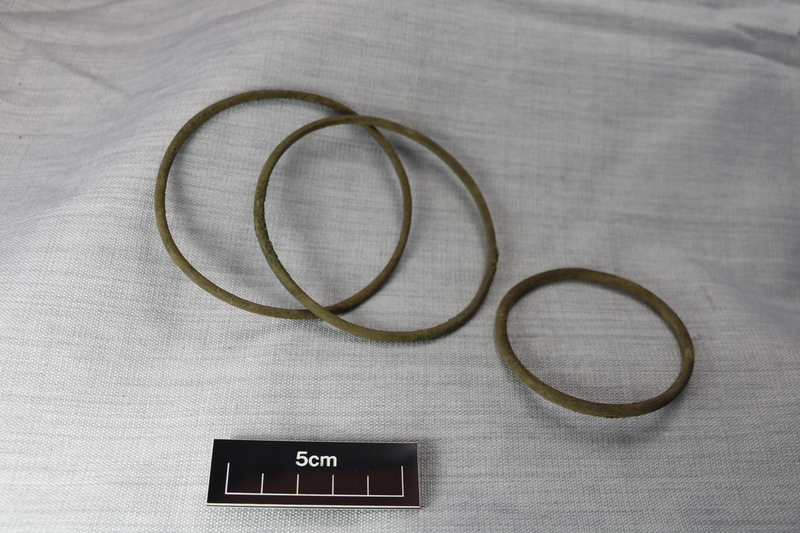 The bracelets are made of a copper alloy, a mix of copper and tin to make bronze. 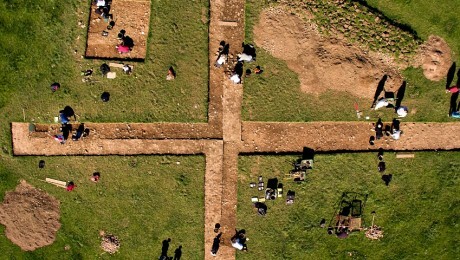 They are described as ‘penannular’, which is an archaeologist’s way of saying ‘not a complete circle’. They have oval terminals on the open ends, and are just under 6cm across. The hoard also includes complete armrings. 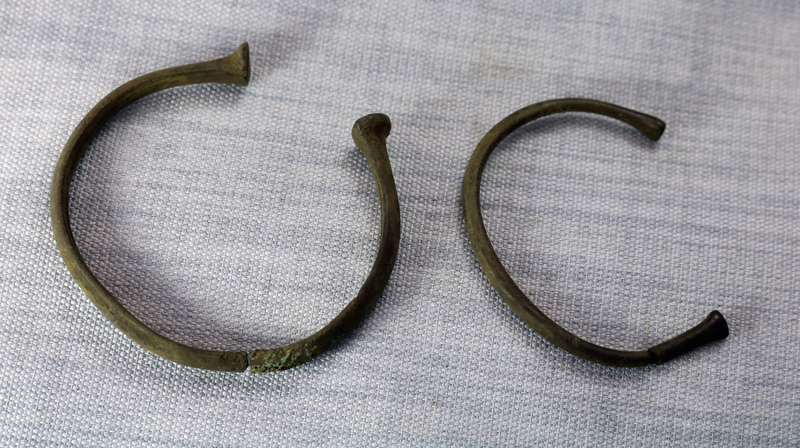 These armrings are a type of jewellery, and may also have used as a form of currency during the Bronze Age. They were made out of a solid copper alloy rod, and some of the seam where the ends met are visible on one of the armrings. Their size is how we know they wouldn’t have been worn on the wrist, but rather on one’s upper arm. 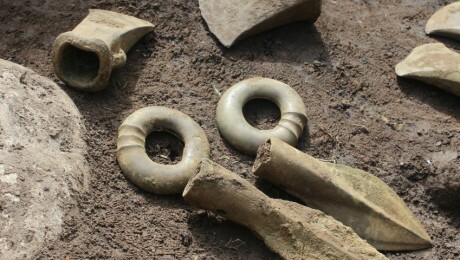 DigVentures excavated a trench immediately over the findspot of the Lancaster Hoard. 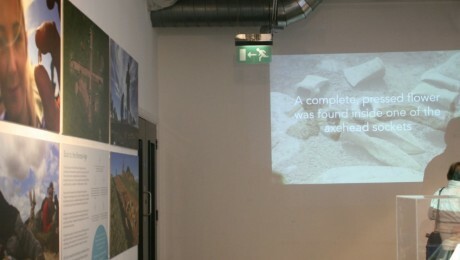 The model above shows part of the hoard in the exact place some of the artefacts were found. 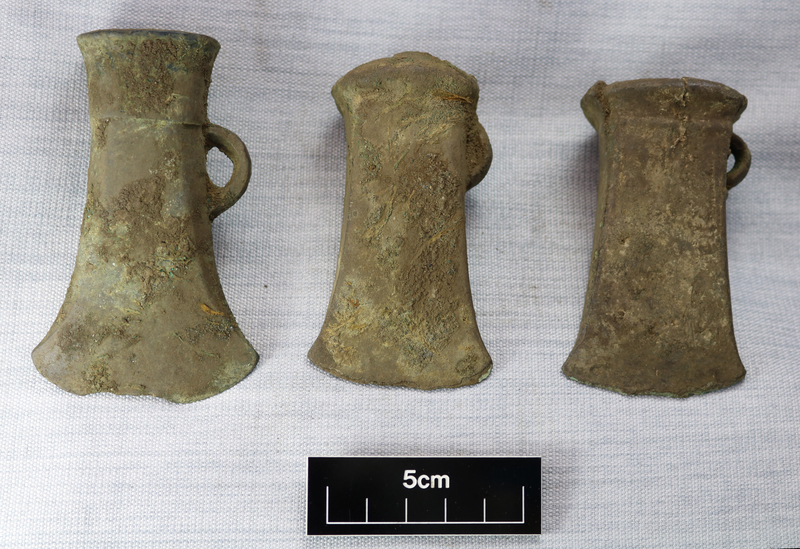 All five axeheads are visible, as well as two of our three spearheads and the two horse harness rings. As well as the bronze artefacts, there were two pieces of pottery and a shard of burned glass dating to the Roman period 43AD-410AD. There is also a small flint barb that could be from the Mesolithic (8,000BC-4,000BC).